“With the additional blades, you can chop your herbs straight into your dish." Sometimes, you just want something that’s going to get the job done. You don't care about being a master chef, you just want to know that one night you can cut up chicken breast, and the next you can prep greens for a salad. You don’t need to get too fancy (or spend a ton of money), so a pair of multi-purpose scissors will absolutely cut it for basic, everyday use. This OXO Good Grips pair is a definite win. Not only are they less than $20, but they're also super comfortable to use thanks to cushioned pads. The micro-serrated blade helps make sure you’ll grip items securely and prevents any slipping. But the best part? These shears are super versatile. They can cut herbs as seamlessly as they can cut meat, flowers, and vegetables. If you’re looking to up your cooking game, you might want to invest in a category-specific pair, like poultry shears, but for getting the basics accomplished, this is a solid choice. Don’t want to spend a ton of money on kitchen shears? We don’t blame you, and this KitchenAid pair strikes a nice balance between affordable and high-quality. Not only is KitchenAid a brand name to trust, but this pair of shears is multi-purpose, so it can accomplish most anything that you’ll need it to in the kitchen. At under $10, it’s a great pair to use if you don’t cook often, or if you want to test out using shears vs. a knife before you make a sizable investment. These have a soft-grip handle, so they won’t kill your hands while in use, are dishwasher safe, and have extra-thick blades for strength and durability. Like most KitchenAid products, they comes in a variety of super fun colors (definitely check out the aqua sky), so you can add a little pop to your kitchen gadgets. If you cook chicken regularly and want to invest in a pair that's better suited for the task, we recommend the OXO Grips Spring Loaded Poultry Shears. While multi-use shears will definitely get the job done, using scissors designed specifically for chicken will make your job easier and safer. These shears feature sharp, stainless steel blades that are perfectly tapered, so you can access those hard-to-reach places. The handles are also spring loaded to help prevent hand strain while using. Not only are these shears precise when it comes to cutting, but they've also got a no-slip grip, in addition to a handle lock, so you don’t have to worry about your kiddos when they’re on their own in the kitchen. This one is not dishwasher safe, so make sure to hand wash, instead. Want to take a look at some other options? See our guide to the best knife sets. It's always a good idea to be on the lookout for anything that might make cooking a turkey dinner easier—whether or not it's the holidays. That's where these JoyFork poultry shears come in handy. If you’re going to butcher a turkey, you need something a little more heavy duty than what you’d use for chicken, and these stainless steel poultry shears are up for the task. Not only are they rust-resistant (this means they’ll last you a lifetime), but the micro-bacteria in poultry won't stick to the stainless steel, so you can easily wash away poultry-borne diseases. Though the handles are easy-grip, these scissors were designed with professional strength, so you know they’ll get whatever job you need done. Whether for a commercial or home kitchen, these powerful shears can handle chicken, fish, and beef, in addition to turkey. Once the holidays are over, you can incorporate them into your regular weeknight dinner rotation. If you’ve ever used a Japanese knife, you know their kitchen tools are top of the line, and these shears are no exception. Shun is the créme-de-la-créme of Japanese kitchen tools, so be prepared to spend a little bit more on these shears—they're totally worth it. This pair still comes in under $100, but it's definitely significantly more than the others on our list. However, you're getting a lot for that price. The blades are made with high-carbon, molybdenum-vanadium stainless steel, meaning they’re incredibly durable, and will last a lifetime. The commercial-quality shears feature a micro-serrated bottom blade to grip slippery foods and a smooth top blade for a clean cut. There’s even a bone notch at the end of the blade to easily cut through chicken bones. Mincing fresh herbs can be a serious pain, but a pair of herb shears will make your life so much easier. 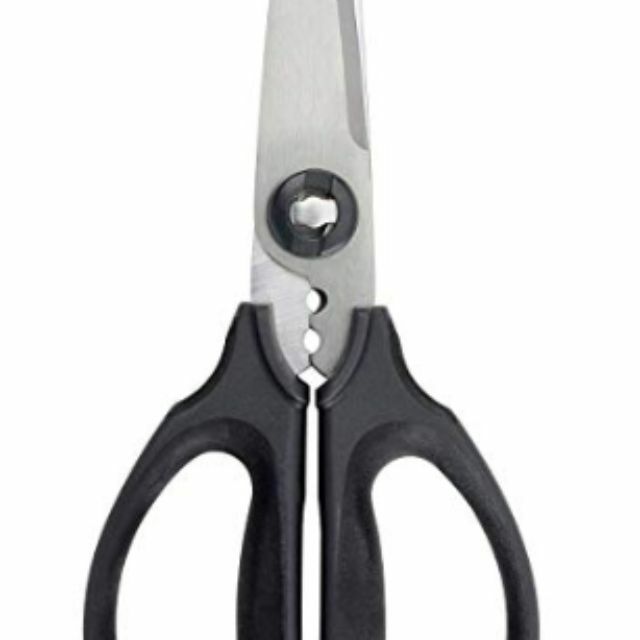 This Chefast pair has five stainless steel blades, giving them a serious advantage over multi-purpose scissors. With the additional blades, you can chop your herbs straight into your dish, both quickly and efficiently. Thanks to an ergonomic handle, you don’t have to worry about slipping while using them, either. These shears also come with a super-handy feature to make clean-up totally effortless: a cleaning comb built into the safety cover. When you’re not using them for herbs, they’re also perfect for crafting or shredding papers. In addition to the cleaning comb and safety cover, these shears also come with two herb bags. ﻿Take a peek at some of the other best kitchen gadgets that you can buy online. The worst part of cooking a meal is always the clean-up. To make your kitchen clean-up just a little bit easier, this pair of Wusthof kitchen shears can be taken apart for easy cleaning and seamless re-sharpening. Not only is clean-up a dream, but these are a high-quality pair, made from high-carbon stainless steel, and can also be used as a jar opener, thanks to some handy steel tooth inserts in the middle of the handles. The 8-inch shears are also ideal for cutting flowers, food, paper, and even cardboard, and they’re designed to work equally well whether you’re a lefty or righty. Online reviewers “don't know how they ever lived without these,” so the Wusthof Kitchen Shears might be everything your kitchen has been missing, too. Planning to cut seafood shells? Maybe you need to crack some nuts. How about opening a bottle cap? You need a heavy duty pair of shears that can accomplish any and all of the above—and be guaranteed to last. This Gidli pair doesn’t mess around. Not only is it one of the sharpest pair of scissors you can find, but it can also do so many things. From cracking seafood shells and cutting through poultry skin to scraping off fish scales and opening bottle caps, these shears can tackle it all. These professional kitchen shears are incredibly durable, made with heavy duty stainless steel, and they’re guaranteed to last a lifetime. The ergonomic handles make use more comfortable, and they’re also dishwasher friendly—so if you’re not in the mood to hand wash, you have an out. If you’re looking for a heavy-duty pair of shears to add to your arsenal, this is a great option. Our writers spent 2 hours researching the most popular kitchen shears on the market. Before making their final recommendations, they considered 20 different kitchen shears overall, screened options from 20 different brands and manufacturers, read 30 user reviews (both positive and negative), and tested 1 of the shears themselves. All of this research adds up to recommendations you can trust.